Menorrhagia is a common problem that females face. Menorrhagia is basically a condition in which women experience heavy menstruation. It is not easy to find out whether you are having normal or heavy periods in comparison to other females. Some females think that they are having heavy flow, but they actually have average blood loss. Whereas, some feel that they have normal blood loss, but they actually have heavy blood loss. Usually the first three days are experienced with more blood loss. It is not easy to calculate or measure the loss of blood during the cycle. In case the loss of blood occurs between 30 to 40 ml every month, then bleeding will extend up to seven or eight days and here bleeding for five days becomes average. In case the loss of blood is 80 to 90 ml or more than that, it becomes more difficult to measure the amount of blood loss which occurred during the period. Excess bleeding through to clothes or bedding. If there is a frequent requirement to change the sanitary towels and/ or tampons. If extra or double sanitary protection is required with tampons as well as towels. Excess Staining and Soaking of bed sheets and clothes. Passing out large clots of blood during urination. Disturbance in normal activity due to heavy bleeding. Menorrhagia basically is experiencing heavy menstruation every month. 2. Due to Hormonal Disturbance : If there is fluctuation of progesterone and estrogen, the endometrium (inner lining of uterus) become thicker. This is when shed during periods, heavy bleeding occurs. 3. Uterine Fibroids : These are actually non-cancerous (benign) growths which occurs in the muscle of the female's womb. It does not cause that much problem but might lead to symptoms like heavy periods. 4. Uterine Polyps : These benign growths can result in higher hormone levels. 5. Adenomyosis : Glands from endometrium become embedded in the muscle of the uterus. 6. Anti-coagulant drugs can lead to heavy bleeding. 7. Pelvic Inflammatory Disease : Infections inside the female's womb. 8. A cancer known as endometrial cancer that occurs in the lining of the womb. 9. PCOD : In case of irregular ovulation, periods also become irregular. It is very common in a female suffering with polycystic ovary syndrome. 10. Females with imbalanced thyroid might also suffer with heavy periods. 11. The intrauterine contraceptive devices can cause heavy menstruation. 12. Decreased platelet count like in case of thrombocytopenia. In Ayurveda, menorrhagia referred to Raktapradar. Pitta aggravating causes lead to aggravation of pitta Doshas and impairement of Rakta dhatu. Impared Rakta dhatu when moves towards the pelvic region causes imbalance of apana vata. 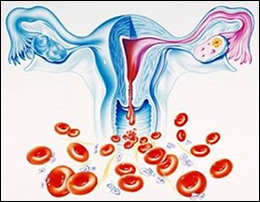 Low apana vata and contaminated blood increase menstrual blood, which leads to Menorrhagia. 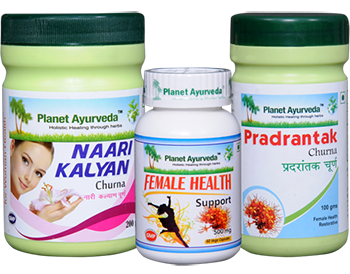 Planet Ayurveda provides effective herbal remedies for excessive menstrual bleeding. 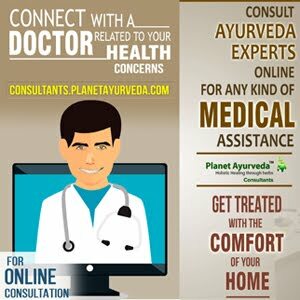 All these herbal remedies of Planet Ayurveda are 100 percent pure, natural and vegetarian. This Pack consist of mainly following herbal preparation. This Herbal Remedy is formed using three herbs that are Arjuna, lodhra and shatavari. These herbs are great hemostatic agents that can control bleeding from any site in the body. The herb shatavari is considered as the best female rejuvenating herb since ancient times. This herb provides relief from the pain that arises due to excessive bleeding in the form of cramps. Ashok : One of the prime uses of Ashok herb is in the treatment various menstrual disorder like congestion, pain and bleeding. It is very beneficial to the endometrium and uterine muscles. It is also very effective in clearing congestion and has a nourishing effect on the circulatory system. In addition to this, Ashok is very helpful in treating hemorrhagic dysentery. It is also useful in treating pain. Along with that Ashok also has lot of beauty benefits. Lodhra : Lodhra bark has been in use for thousands of years in Ayurvedic healing practice. Lodhra has a lot of beauty benefits. Lodhra bark helps in treating various skin disease, swelling, bleeding wounds and ulcers. Along with this, Lodhra is very helpful in treating diarrhoea and dysentery. Shatavari : Shatavari comes from Asparagus species in Ayurveda. Shatavari is very beneficial in dealing with gynecological issues and alleviate abdominal cramping, headaches and inflammation. It is very beneficial in strengthening the reproductive system of women and regulate hormonal imbalance. Dose: 1-2 cap twice daily, with plain water after meals. Pradrantak churna is a pure herbal formulation. This medicine helps to maintain the reproductive health of the females. It helps in maintaining the hormonal balance in the body of the females. All these 4 herbs are combined together. Their properties are synchronized together to make the herbal formulation named Pradrantak Churna. It is very effective in maintaining a healthy life. Dose: 1-2 tsp twice daily with water or pomegranate juice after meals. It is a very effective herbal medicine for relieving symptoms of menopause. The herbs work in a synergetic manner and provide relief from the heat, hot flushes, weakness, cramps, low bone density, irritable temperament and other related symptoms. Mental tension and stress related symptoms can be relieved with the help of Naari Kalyan Churna. Palpitations, hot flushes caused during menopause can be controlled effectively with this medicine. Naari Kalyan Churna regularizes the monthly cycle and excessive bleeding. Dose: 1-2 tsp twice daily with plain water after meals.